The Drawing That Taled. A funny animated story for kids. Pinty Tailor was a little boy who enjoyed going to school and doing all sorts of things, except for art and writing. Using brushes and pencils did not come easy to Pinty, so his works of art did not end happily, and he would just give up in disgust. But one day Pinty found a pencil of such lovely colours that he could not resist, and he tried drawing a circle. As ever, it did not go well, and he was about to throw the pencil away when his drawing began to speak to him. ‘Psst! You aren’t going to leave me like this, are you? Come on, the least you can do is draw me a pair of eyes!’ said the drawing. Pinty was understandably shocked, but he managed to draw two little spots inside the circle. ‘I don’t draw very well,’ said Pinty, trying to make excuses. ‘OK, no problem,’ the drawing interrupted him, ‘I’m sure that if you try again you’ll do better. Go on, rub me out!’ So Pinty erased the circle and drew another one. Like the first one, it was not very round. ‘Hmmm, I think I’m going to have to teach you how to draw until you can do me well,’ said the circle with its quick, squeaky little voice. To Pinty, who remained almost paralysed with shock, this did not seem like a bad idea, and he immediately found himself drawing and erasing circles. The circle would not stop saying ‘rub this out, but carefully; it hurts,’ or ‘draw me some hair, quickly, I look like a lollipop!’ and other funny remarks. After spending nearly the whole afternoon together, Pinty could already draw the little figure much better than most of his classmates could have. He was enjoying it so much that he did not want to stop drawing with this crazy new teacher of his. Before going to bed that night, Pinty gave his new instructor a hearty thank you for having taught him how to draw so well. 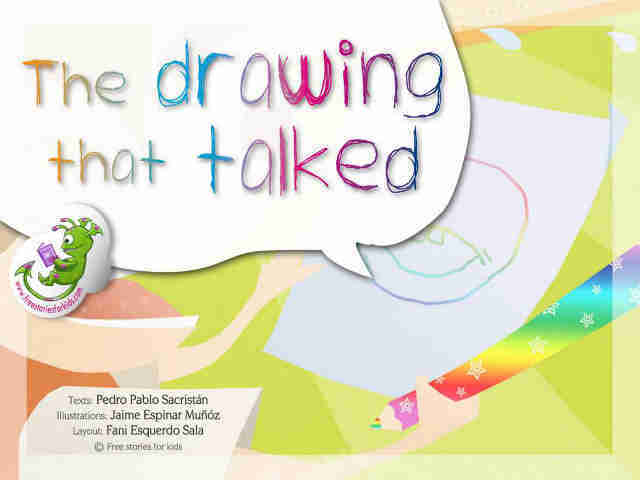 ‘But I didn’t do anything, silly!’ answered the little drawing, in its usual quick manner. Pinty stopped to think. The truth was that previously, he had drawn so badly because he had never practiced more than ten minutes at a time, and he had always done it angrily and grudgingly. Without doubt, what the little drawing had said was correct. ‘OK, you’re right, but thank you anyway,’ said Pinty, and before he went to bed he carefully placed the pencil in his school bag. The next morning Pinty jumped out of bed and went running to find his pencil, but it was not there. He searched everywhere, but there was no sign of it. And the sheet of paper on which he had drawn the little figure, although still full of rubbing out marks, was completely blank. Pinty began to worry, and he did not know if he had really spent the previous afternoon talking with the little man or whether he had dreamt the whole thing. So, to try to settle the matter, he took a pencil and some paper and tried to draw a little man. It turned out not bad at all, except for a couple of jagged lines. He imagined his bossy little teacher telling him to round out those edges, and that it looked like he was trying to give him spots. Pinty gladly rubbed out those bits and redrew them. He realised that the crazy little teacher had been right: it made no difference whether you had the magic pencil or not; to manage to do things, you only needed to keep trying and to enjoy doing so.